Canbodia is the fourth major location in the game. It is the central location of the Canbodia Adventures and becomes accessible once you have assembled a crew for your Wonka Boat. 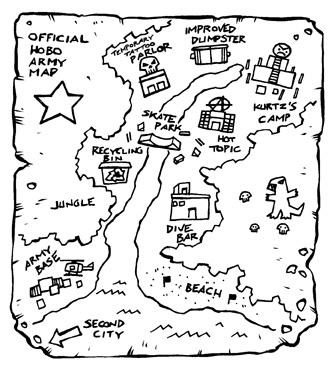 The Hobo Army Base; not much to it. An explorable jungle; has random encounters/fights and ingredients. For 5T, one can sail the river; offers random items & bonuses. Sells booze; features a neat tip jar. Once you complete the mission here, you are be able to play Stratego for one Smart Bread every day, at a cost of 30T. A clothing store that doesn't sell anything. A better version of the Corner 7/11 Industrial Bin that offers more items. Kurtz's hideout, obviously. If you have Sticks, you can make Fire here. The famous Canbodian Mines where you can mine for ore and Hobalt Shards and exchange them for various goods. You must first traverse the Technicolor Jungle to find this area. A place where you can donate your cans in return for Recycling Points and cash. Bet you wish you knew how to skateboard. A jungle full of alcohol-infused berries and goodies in its deepest corners. The location is added to your map after listening to the Old Man at the beach. Brand your hobo with a benefit-bestowing tattoo. This page was last modified on 12 December 2013, at 12:10. This page has been accessed 26,511 times.